As video content is becoming more and more common in all aspects of our day to day digital life, we have come to expect to find more of our answers in video content. This has prompted a lot of investment in video by marketing departments around the globe. With many new tools surfacing to make creating video more accessible, video content has become important to all types of interaction with customers. These developments have not been lost on Hubspot. They have offered integrations with several video hosting/software providers for some time and there are plenty of mentions of the importance of video in their educational content. Until this month there were no native tools to create, track, and convert from video within Hubspot. The upload and embedding process for the video was clunky and there was no possibility to add interactivity or track video analytics without investing in additional video platforms such as Wistia or Vidyard and then integrating them with Hubspot, which added substantial cost and complexity. Roll on Inbound18, Hubspot's yearly inbound marketing conference and their announcements about their partnership with Vidyard to offer new, native video capabilities across their Marketing, Sales and Service Hub tools. Notice the video announcement importance as it is left for last (skip to 45:12 for the video tools). The integrations are based on existing Vidyard tech but are fully integrated with Hubspot tools. If you are a Hubspot marketing professional or enterprise customer, these updates should have been rolled out to your Hubspot portal by now. There are new native video analytics and very excitingly, you can now also embed Hubspot call to actions and forms within your uploaded videos. Hubspot released a lot of information about these new tools. There are product update videos for Hubspot's marketing, sales and service hub tools. Hubspot also wrote an extensive blog post where they combined the information and their setup and use videos. You can find the Hubspots new video feature announcements HERE. 1. In Hubspot -> Under Marketing -> Select Files and Templates -> Files. 3. Click to accept the additional terms and enable Vidyard. The integration is now enabled, but to get video tracking on existing videos you also need to enable tracking for each of the video files individually. To do this, browse to your video file in the file manager and click on it. In the video options, you will now find the additional toggle for Allow embedding, sharing, and tracking - Enable this to allow tracking information to be gathered for the video. You can also change the Thumbnail for your video in these settings at this point according to Hubspot. However we found that to ensure that tracking was enabled, we needed to go to any page or post the video was embedded on and reinsert it there before any statistics were tracked. For videos uploaded after the feature is enabled, the tracking should be enabled automatically. NOTE: Hubspot has already made change between this video being recorded and this post being published! 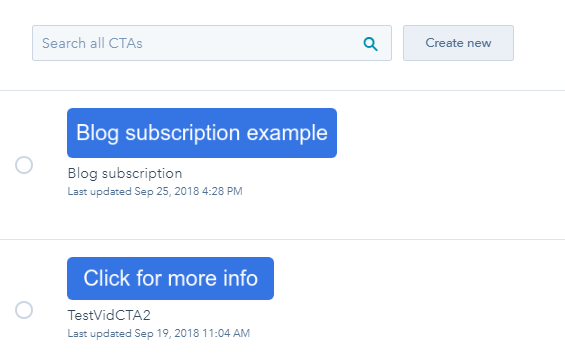 You can now also reuse existing CTA's using search (which makes sense). Add the uploaded video to a post or page in Hubspot by clicking the Camera Icon in the editor bar. Once the video shows up in your page/post in the editor, click the video image once and click edit. The edit panel will open to the right of the video. Click on the Call to Action radio button - the click Create CTA - you can now search for an existing CTA or create a new one. Give your button a name and optionally change the padding and button color, then click next. Back at the video options window - pick to insert the CTA Before Video Starts or After video finishes . Thats it! If you play your video through, you will see the call to action overlaid on your video at the end. When the button is clicked it will take the viewer to the link you defined. This presents an exciting conversion and tracking opportunity! Your second option for conversion and interactivity is to add a form into an uploaded video. This provides even more powerful opportunities to convert your potential leads. A very exciting change in its own right. Upload a new video or add an uploaded video to a post or page in Hubspot by clicking the Camera Icon in the editor bar. Once the video shows up in your page/post in the editor, click the video image once and click the edit button underneath. Use search to insert an existing form or create to create a new form. We will click Create to create a new form for this example. Note that you can change the form fields and change the text on your button. Back at the video options window - pick to insert the form Before Video Starts or After video finishes . That's it! If you play your video through, you will see the form overlaid on your video at the end allowing you to bring your (potential) leads a step further in your conversion process right from within the video. This presents another exciting conversion and tracking opportunity! Metadata is particularly important for video and image files as the data in the files themselves can not be read by search engines. This means that meta data presents your only opportunity to make the contents of video files understandable to search engines and crawlers. Before the recent changes to Hubspot video features, there was no possibility to add this type of metadata to videos hosted on your Hubspot portal. Now that this option is added, we recommend adding this metadata to any video uploaded to your Hubspot hosting, old or new. This will greatly increase your changes that these videos will be found by the right audience at the right time. In Hubspot portal, go to edit an existing Post or page or create a new one if required. Insert a video by clicking on the video Icon in the edit bar. Once the video is inserted in the post or page, click the video once. two buttons will appear, edit and remove. click Edit. The video Options window will open on the side. Towards the bottom, you will find an option to Edit video details. The video metadata now shows. 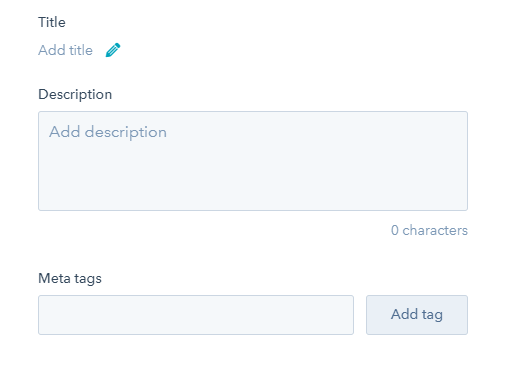 Pay particular attention to adding a Title, Description and relevant Meta tags. Once your down click out of the window and your video should far more easy to understand for search engines, greatly increasing your chances to be found! We found these after selecting Marketing - Website - Blog Post and then selecting the blog post with Hubspot hosted video that we had views on. In the page details you can now see these video analytics. These video vies and retention stats were added to our page specific stats where we did our test. Especially the retention stats provide great extra detail on how your videos are viewed and where your viewers might drop off. We hope that video reporting will be integrated in the general reports soon to give you a better overview of the tracked stats. This was mentioned in Hubspot update notes so these reports should soon be available as well. There are definitely some signs that the new Hubspot video features are still in Beta, we encountered a number of bugs while working through setting up and testing the video marketing features and found that although Hubspot made quick and big efforts to get proper documentation out there in the form of product updates, the amount of outdated information that comes up when searching for documentation was quite confusing when we tried to work through setting up the new video features. - Bug: No option to use an existing CTA . Unlike when you add a form to a video, you can only add a new CTA to a video even-though any added Call To Action is saved to the CTA''s and findable under Marketing - Lead Capture - CTA's. Check our video on how to add a CTA for details on this. UPDATE: By the time of posting this Hubspot already fixed this one. Nicely done Hubspot! - Bug: When you add metadata to a video - After adding the first tag, you can not longer separate multi word tags using a space. 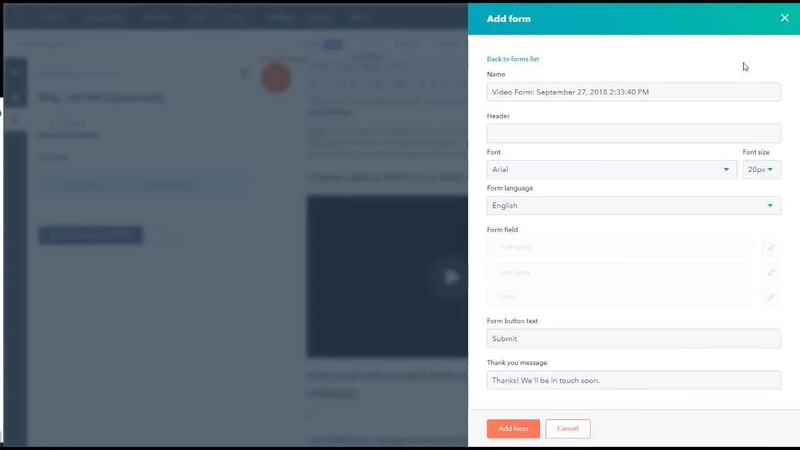 - Limitation: You can only add forms and CTAs at the start or end of your video. It would be fantastic if you could also add these anywhere on the video timeline. This would hugely increase the possibility of optimizing your video for conversion. - Video tracking stats are only available on the page/post statistics. Hubspot has announced a video dashboard, but with our initial tests we were unable to locate it. Knowing Hubspot, and looking at their product updates, this should be added very soon. - Video tracking data didn't seem to be 100% reliable during our first tests with an embedded video. Some views didn't seem to appear (We used a variety of devices and internet connections to a simulate a small but varied user base while testing and the results didn't seem to reflect the plays completely accurately. Admittedly the sample sizes we used in our tests are too small to make any clear conclusions but the fact that we can see a margin of error in a very small sample size is a bit worrying. This is likely again a Beta bug and we expect that this will improve rapidly knowing Hubspot quality control procedures. The bugs and limitations give a clear beta feel to the new video tools. 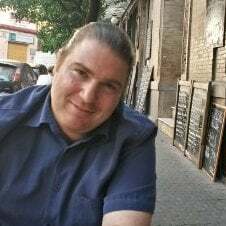 This is not uncommon when big features are added to Hubspot, since they (and other SAAS companies like them) develop new features on a continual basis. Hubspot deploys over 300 times a day! This type of development cycle means that updates are pushed out when they are considered usable and then refined using user feedback to iron out bugs and increase functionality. The development team at Hubspot and their support feedback cycles normally operate very efficiently so bugs are ironed out quickly and feature sets expand constantly. Is it worth investing resources to utilize Hubspots new video marketing tools? So is it worth investing your time and resource to utilize Hubspots new video Marketing tools? Our opinion in short is yes, absolutely! Especially the conversion opportunities are a major improvement and very powerful new weapon in your conversion arsenal. They are easy to implement and work sufficiently to be worthy of your investment. The metadata and tracking additions are hugely powerful in their own right to help you attract more visitors and leads to your content. Data that can give you powerful tools to understand the real impact of your promotional videos. The possibility to use video stats in your Hubspot workflows. Information on the usefulness and drop of point from your video audience. It's worth thinking about how you can incorporate video conversion into your Inbound strategy. If you have any existing videos hosted on Hubspot, I would recommend turning on the new feature and enabling your video stats today. Any video statistics and video drop off data is better then what you have now (no video tracking data and statistics at all within Hubspot). The same goes for experimenting with video forms and CTAs. Tapping into a fairly new and as of yet not very common conversion opportunity right from within your Hubspot hosted videos has immense potential that you should not ignore. 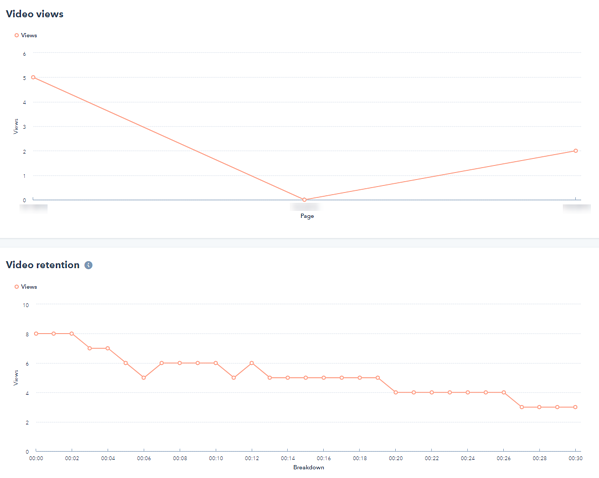 It is also worth noting that the new upload engine for videos makes adding videos to your Hubspot hosting a lot quicker than it was in the past. This should also help to lower the the time it takes to get started with the new video features. Have you had the chance to enable these new video features? If so, we'd love to hear your impressions and feedback, so don't hesitate to leave any comments below.